The IP211/EP211 Series transducer is an electropneumatic device that reduces a supply pressure to a regulated output pressure directly proportional to an electrical input signal. The 211 Series accepts a wide range of supply pressures, ranging from a minimum of 3 psig (0.2 BAR) above the maximum output up to 100 psig (6.9 BAR). An integral pneumatic volume booster is included in the design to provide high flow capacity (up to 12 SCFM). Model selection includes General Purpose, FM Intrinsically Safe, and CSA Intrinsically Safe. 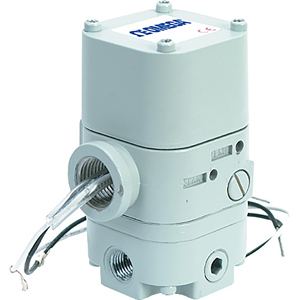 These transducers can be pipe, panel, or bracket mounted in any position. Positions other than verticle will require recalibration of the zero adjustment. For maximum output stability the transducers should be mounted in a vibration free location or such that vibration is isolated in the X and Z axis. All transducers are calibrated at the factory for direct acting operation but may be used in the reverse acting mode by reversing the polarity of the signal leads and recalibrating. When recalibrated for reverse acting applications, the transducers provide a minimum of their full rated output pressure (i.e.15, 27, or 30 psig) upon input signal failure.